One of Southwestern’s greatest strengths is our flexibility. As we have said previously, our program can be tailored to your level of commitment and your goals…regardless of whether you are simply looking for a good sales opportunity or whether your plans are much more grand. If you are tired of doing all the work for someone else and want to start on a new, independent path to a higher income, Southwestern can train you and equip you to be successful on your terms. Our Independent Sales Consultants and Agents in the United States, Canada and Europe enjoy the unlimited earnings potential of commission sales and all the freedom that comes with self-employment. And they enjoy these benefits without any investment other than their time and effort. 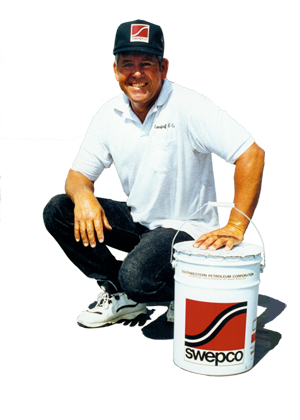 As a SWEPCO Independent Sales Consultant, all of your sales materials and training are provided at no cost. If you want to start a one or two-person small business and grow as your capabilities grow, we can train and equip you to achieve those goals…and we can do it without large investments or legal complexities. We can show you how to get started in this highly profitable business quickly and with very little cost. If you are an existing company in one of our export markets looking for new or alternative markets for expansion or diversification, we can train and equip you to become a stocking distributor with maximum penetration in this highly lucrative industry…again, without major capital investments or complex contractual arrangements. Regardless of your goals, we can help put you in the industrial and commercial roof and building waterproofing and maintenance business. And you will find that Southwestern Petroleum Corporation makes the majority of the front end investment. We supply a quality product, strong training and consistent marketing and technical support. The primary ingredients you are asked to supply are energy, commitment and the willingness to learn our proven marketing plan. We think this is a good approach and a good investment because we know from eight decades of experience that our program can make our investment in you pay off…for both of us. The one thing you will always have in your association with Southwestern Petroleum is control. Whether you choose Southwestern as a new career or a new business, you will have the best of both worlds…the backing of a strong, successful corporation…and the freedom and independence to pursue this opportunity as you see fit. You will have access to all the sales, marketing and technical assistance you require, but without strings. We will give you the benefit of our experience. We may even recommend you do something a certain way. But we’ll never tell you that you have to do things our way.